A couple of weeks ago I promised to tell you more about my new Twisted Orchid handbag, and here's the inside look! Keep reading and you'll see why I'm excited to be taking this handbag with me to the BlogHer conference this August. And with our secure online shopping, guaranteed delivery, and 30-day hassle free returns, buying from Twisted Orchid is convenient and absolutely risk free! I'm amazed at the incredible selection available on the Twisted Orchid site! There are just so many cute bags to choose from! I particularly love the animal-friendly leather tote they sent me to review because no animals had to die for me to feel chic and stylish. It is slick, snakeskin-ish and shiny. It's also very practical; it's nice and roomy so you can tote everything you need, with 3 zippered compartments so you can keep your stuff organized. And speaking of animal-friendly, they've also got a great line of eco-friendly totes, messenger bags and bamboo handbags. How's that for a stylish way to celebrate Earth Day! So far, nothing bad to report! This tote bag is holding up, it's easy to clean (just wipe with a damp cloth) and it looks great. Twisted Orchid is your one-stop shop for chic and stylish bags. 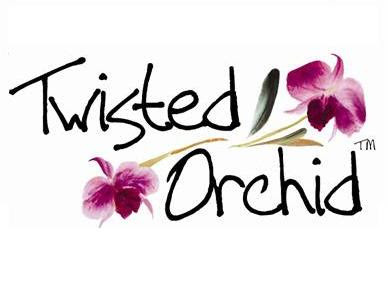 One lucky Bonggamom Finds reader will win a Twisted Orchid bag up to $75 value! Visit Twisted Orchid's website, then leave a comment on this post telling me which bag you would choose if you won. 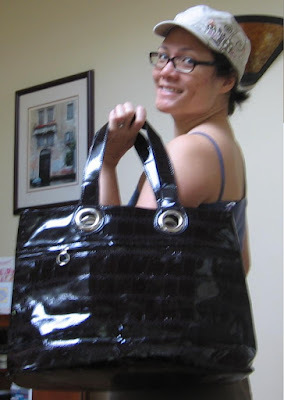 I entered your giveaway for a Twisted Orchid bag on Bonggamom Finds! 4) Follow Bonggamom Finds on Networked Blogs (leave a comment with your FB id). 7) Click on this link and enter the CafePress American Idol sweepstakes (leave a comment here telling me you've joined -- this is only valid till April 30, 2010). Maximum of 8 entries per person. This giveaway ends at midnight PST on May 8, 2010; I will draw a winner at random on May 9 and post the winner's name after the winner confirms acceptance. For additional giveaway rules, click here. Good luck! I love the Black and White Greta Evening Bag ! I follow Bonggamom Finds on Networked Blogs (Charity Brengle Donovan). Wrote on the Bonggamom Finds Facebook fan page wall (Charity Brengle Donovan). I follow on blogger (Charity Donovan). I would take the black pearl gathered bag. The Vintage Bronze Purse is my favorite! I posted about the giveaway on your Facebook Wall too! LOVE the Primrose Yellow Large Tote. And love that it is animal friendly! LOVE the purple large tote. Item Id: LS:3322d. Win or lose I would love one and will be saving my pennies! Thanks for the giveaway! Posted on Twisted Orchid's facebook page. I'd choose the Spring Fair Eco Weekend Travel Tote. Thanks. I love the chartreuse plaid hoop bag. I like the Black Pearl handbag. I am a fan of your's on facebook and tag a contest link on the wall. I would choose the Spanish Cream Lux Gator. I'm totally loving the Pumpkin Diva bag! So cute! I like you on FB: Cori Eckstrom Westphal and wrote on your wall. I like Twisted Orchid on FB: Cori Eckstrom Westphal and wrote on their wall. I'd get the Wide Striped Hoop handbag. This giveaway is now closed. Thanks to everyone who entered, and congratulations to the winner: #57, Dwalline!